We stumbled on a great little Thai street food joint in the most unlikely of places, a food court in Bondi Junction, with million dollar views. 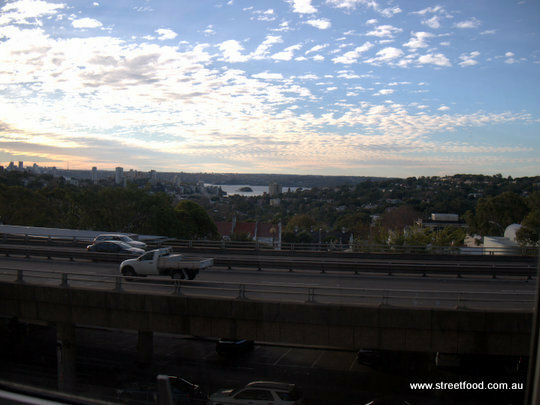 The foodcourt above Bondi Junction interchange is nothing flash but the view is amazing. We stopped by for a gawk and a thirty cent McIceCream, and noticed the little Asian joint across from Maccas was very busy. Folks seemed to have made a special trip to this otherwise culinary nowheresville on a rainy Sunday, some were even taking pictures of their food. Gotta check this out. Turns out Do Dee Noodle Bar is a little gem. It's a Thai joint that does Thai food for Thai folks. There's a bainmarie-of-love with loads of great stuff like you'd see in a roadside stand in Thailand. 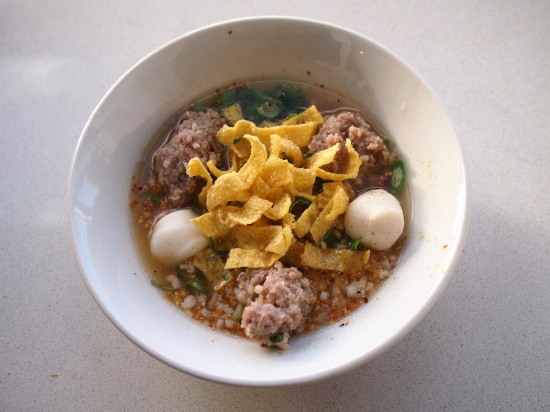 There's also a range of noodle dishes, balls on sticks, Thai drinks and a popular dessert bar. And of course there's the regular Aussie-Thai stirfry stuff, everybody's happy. For us it's tom yum noodle soups that keep us coming back. These are big on flavour and come in a perfect, small, Asia sized serving. The bainmarie-of-love and the food-on-sticks are also favourites. Next visit we'll be into some papaya salad and fried noodles wethinks. Three choices on rice from the bainmarie, it may not be pretty but this is real Thai food folks. Spicy larb, some fish and some greens mixed with some kind of offal. Shawn isn't too keen on the offal but the rest is fantastic. Two choices from the bainmarie. 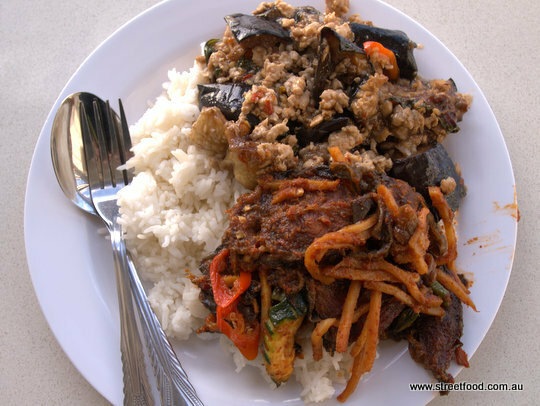 How could you go wrong with minced pork and eggplant? We have a second go at the fish. It's a little sweet and not so spicy, and mixed with a little grated veg. The fish has a unique texture, dry with a decent chew to it. We don't know what it's called but we've had this style of fish in Thailand before, we love it. Tom Yum Noodles with Tender Pork - $5.90 small or $11.50 large. The tom yum broth is spicy with fair chili kick. The noodles are the clear 'glass' type which are excellent flavour sponges and really suit the dish. There's mince pork, fishballs and slices of pork sausage with a sprinkle of fried noodle bits on top. Very happy. We went for a large here but we reckon a small one with a side snack is the go. 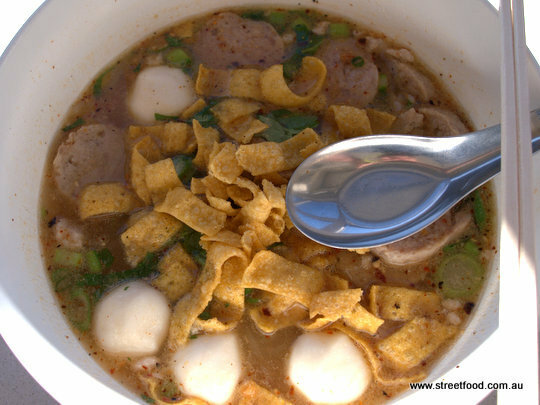 MI6 - Tom Yum soup with fishballs - $4.90. Pretty much the same as above sans meatballs. Do Dee Secret - simply described as 'secret' on the menu - $5.90. We made a special trip on a rainy Sunday just to find out what the secret it is. The secret is that it's the same as the tom yum with tender pork, only covered with greens. Pepper pork noodle - $5.90. Not a tom yum this time but a clear broth with a nice tangy spice kick and flavour soaking glass noodles, lovely little pork rissoles, fishballs and fried noodles on top. Happy. Fish with soft boiled rice - $5.90. 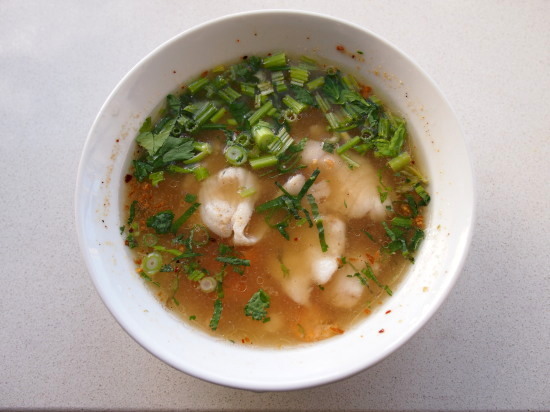 A light tangy broth with a mild chili bite, with poached fish. The handful of rice in the bottom of the bowl makes a nice change to noodles. Happy. Nothing says South-East Asia more than manufactured meatballs on sticks. Choose your sticks from the counter display and the nice ladies will plate them up all purdy for you. We try the fried wontons ($2 per stick) and moo-ping, grilled pork ($2). Served with fresh sliced cucumber and cabbage, with a spicy sweet chili sauce on the side. To our delight the wontons have quail eggs in inside, these are insanely good and such good value. We could easily imaging paying five times the price for these in a restaurant. The dessert bar is popular. 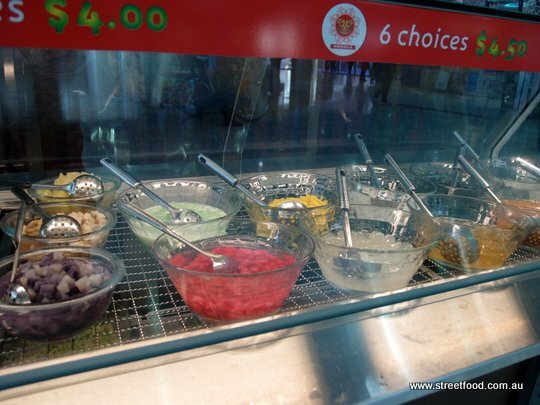 Choose from 4-6 fillings for $4-$5. The nice ladies will served it up with coconut milk, Carnation milk and ice. Yay. 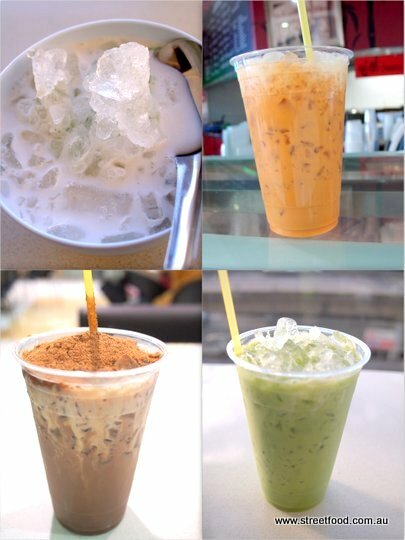 Dessert, Thai iced tea, Thai Ovaltine Volcanoe, Ice green tea. Thai drinks are $3.50. A quick stop for Do Dee Island Noodle Soup - $6.50 - tangy tom yum broth with clear glass noodles, prawns and squid. Aroy mak mak! Do Dee Noodle Bar is at Shop 15 Tiffany Plaza, 422 Oxford Street Bondi Junction, opposite McDonalds. You can access the food court from a ramp thingy in the middle of Bondi Junction Mall, or head upstairs from the interchange. At the time of writing Do Dee Noodle Bar is open 11am-7.30pm 7 days. I went there on your recommendation and got 3 choices + rice for $9 bucks... I ordered 'this one' and 'that one' and 'that one with chicken' :) In any case, they were all excellent. I will definitely be back! You sound like you use the same ordering strategy as us! Glad you liked it, we think this place is a true gem, quite unlike most Thai food court joints we've found. I went there after reading your post too....kinda glad you reviewed this place as I'm parked in the bus interchange downstairs often .....had previously had a pretty good chicken wing there but probably would never had the bain marie ......well had 3 with rice and yeah was pretty darn good. Might be my 2nd favourite bain marie joint after the nido place in Barker St Randwick. ......Bondi Junction is getting so good to eat at now.